The beginning of a new year is a lot about diets and better organising home and tasks. As I'm not on a diet at the moment (I should, but I'm not in the mood for one), I'll have a share in the latter. When it comes to cleaning the house my most hated task is vacuuming. I don't know why, most people I know prefer vacuuming to any other household task. Maybe it's because it's loud and warm. Although my Miele cat & dog does a very good job and I do like the design, in a two storey home a vac's storage place at 50% of the time is at the wrong storey. A few hair on the bathroom floor, some sand from the least weasel's cage, crumbs from the cat loo – I don't want to lug the Miele upstairs for just this. So either this dirt has to stay (and will accumulate) until I'm going to vacuum the complete storey or I have to use hand broom and dust pan, which I hate even more. Some years ago I purchased a cordless broom. This thing was bulky, ugly, even louder than the Miele and the batteries were dead long before I'd finished my job. The worst, it didn't vacuum properly at all. I gave it away after some weeks. A few months ago now I stumbled upon a test report about cordless hand vacs, saying that the rechargeable batteries today are of a different quality and therefore these vacs run much longer than those from the previous generation. There were some really beautiful hand vacs, one being a real designer piece from an American manufacturer. But another very nice one had better test results, was cheaper and had a cute name, the AEG Liliput. I purchased a black one for around € 30 including shipping. One of my best decisions! The charging station is fixed to the wall in my office with the Liliput resting in this cradle while not in use. The charging station and cradle are a bit flimsy and could be improved. But the Liliput is nice and at hand when I need it. And I need it often. Once a day I run it along the edges of bathroom, kitchen, hall and around the least weasel cage. It runs around 10 minutes before it needs to be recharged and this really is enough time. It takes me about five minutes maximum to get rid of the dirt. Due to the air movement that arises when walking through a room, dust bunnies, hair and light dirt accumulate at the bottom of the baseboards, not in the middle of the floor. I never realised that before. With the Liliput vacuuming the edges and corners and the occasional crumbs here and there, my floors look much better now - every day! A small investment for a huge improvement. 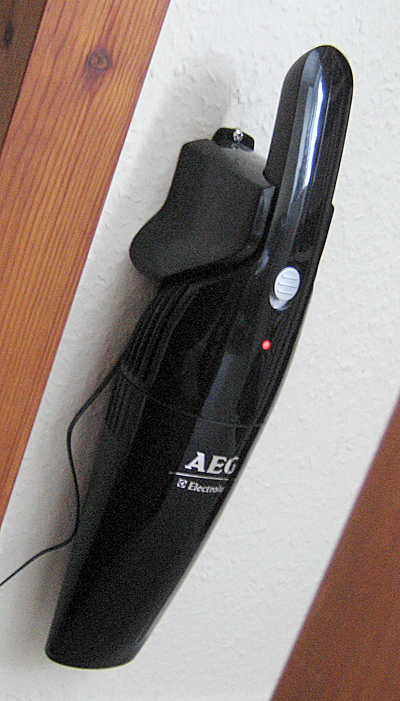 BTW, I'm not connected to AEG in any way and I'm sure, there are other hand vac brands out there that are equally good! You could check Amazon first. They are currently bombarding us with bargain offers (you remember 'Haushaltswochen' at this time of the year??!!). And you can read through all the feedback and get an idea of what is suitable and what not. I think, I started this way, too, but finally got it from a serious Ebay-seller.